Well, in case you missed any of it, I thought that I’d post the whole of “The Charity Case: A Harvey Delford Mystery” in one easy-to-read post. Believe it or not, I made this entire comic in just two days (even though I posted it here over the space of a week or so). 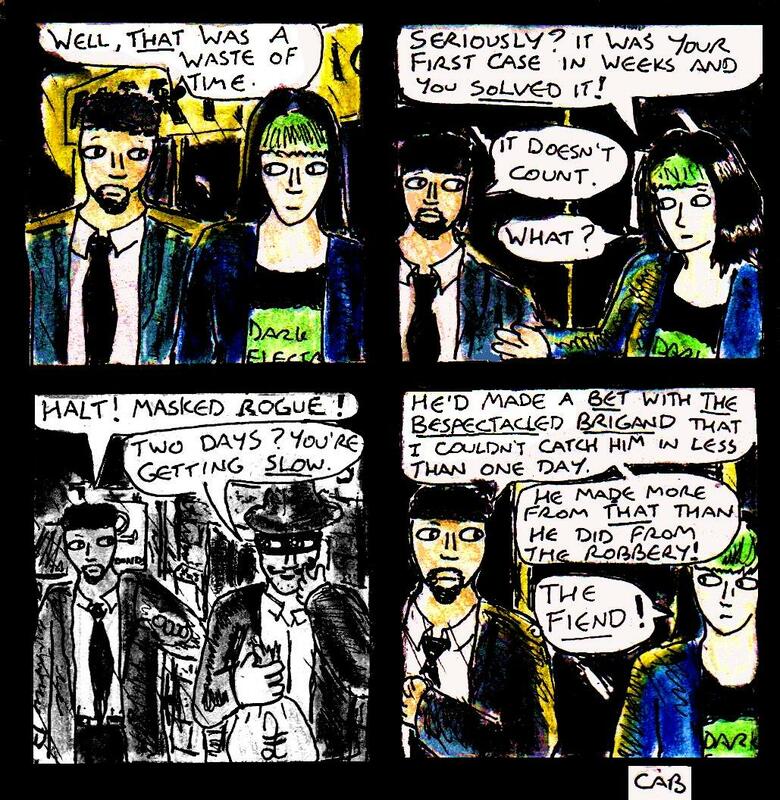 Anyway, this is a film noir parody comic starring Harvey Delford from my “Damania” comics series ( you can catch up on other recent comics in this series here, here, here and here). This comic was a lot of fun to make, if somewhat exhausting during the final two pages. Still, for something I made in two days, I’m quite proud of how it turned out. As usual, all eight pages in this post are released under a Creative Commons BY-NC-ND licence. Likewise, you can see larger versions of each page by clicking on it. Here’s the final page of “The Charity Case: A Harvey Delford Mystery”. This is a new short comic (which is a spin off-from my “Damania” comic series – you can catch up on recent comics in this series here, here, here and here) which I’ll update daily at the usual time. My current plan for this comic is for it to be seven pages long. As with many of my other comics, I’ll post the whole thing on here later tonight in case you missed any of it. Here’s page six of “The Charity Case: A Harvey Delford Mystery”. This is a new short comic (which is a spin off-from my “Damania” comic series – you can catch up on recent comics in this series here, here, here and here) which I’ll update daily at the usual time. My current plan for this comic is for it to be seven pages long. The mystery is solved! But there’s one more page to go, stay tuned for it tomorrow. Here’s page five of “The Charity Case: A Harvey Delford Mystery”. This is a new short comic (which is a spin off-from my “Damania” comic series – you can catch up on recent comics in this series here, here, here and here) which I’ll update daily at the usual time. My current plan for this comic is for it to be seven pages long. And, yes, Derek is terrible at hiding and Harvey is still taking a fairly old-fashioned view of what a “hipster” is. Here’s page four of “The Charity Case: A Harvey Delford Mystery”. This is a new short comic (which is a spin off-from my “Damania” comic series – you can catch up on recent comics in this series here, here, here and here) which I’ll update daily at the usual time. My current plan for this comic is for it to be seven pages long. And, yes like many people of taste and distinction, Harvey is more of a Scotch drinker than a bourbon drinker. Here’s page three of “The Charity Case: A Harvey Delford Mystery”. This is a new short comic (which is a spin off-from my “Damania” comic series – you can catch up on recent comics in this series here, here, here and here) which I’ll update daily at the usual time. My current plan for this comic is for it to be seven pages long. In case you’re puzzled about who the random cast of villains in the second and third panels of this page, two of them were first introduced in this “Damania” comic. Here’s page two of “The Charity Case: A Harvey Delford Mystery”. This is a new short comic (which is a spin off-from my “Damania” comic series – you can catch up on recent comics in this series here, here, here and here) which I’ll update daily at the usual time. My current plan for this comic is for it to be seven pages long.